So the results are in...The Hunger Games have taken the weekend...again, banging out $21.5 million!!! This is the first flick to roll four weeks in a row since Avatar did it in January of 2010. The movie sits at 22nd all-time on the domestic box-office already and it is only four weeks in! The Stooges, as the most family friendly flick (it was rated PG) of the bunch, came in at second at $17.1 million, with the R-rated The Cabin in the Woods jamming a solid $14.8 million, but besting the Stooges per screen average opening on less screens overall. Number 4 was Titanic 3-D and Number 5 was American Reunion. 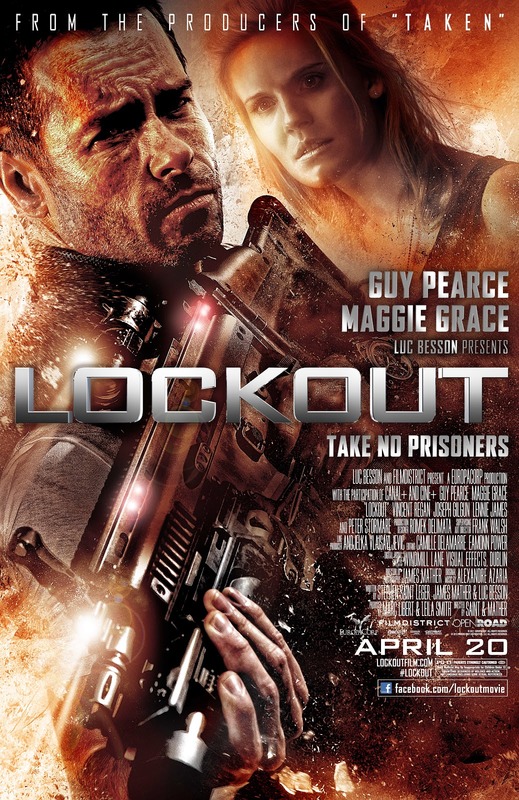 The second flick I review today, Lockout (see below), came in at a paltry ninth place, bringing in only $6.25 million but playing on over a thousand less screens than the stooges. 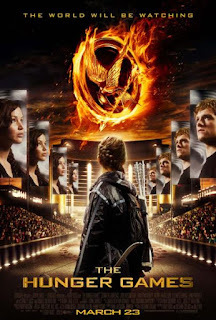 So the PG-13 crowd that should have been seeing Lockout, apparently was watching, or re-watching Hunger Games. I did also see The Raid: Redemption, which I am saving for a mid-week post, but let me say quickly, it is re-donk-a-donk. Also, the week ahead looks bleak...the three wide-openings for April 20th....Chimpanzee, The Lucky One (Ugh), and Think Like a Man. I have little interest in any of those, so it looks like I will be searching the art houses for next week! I fancy myself a bit of a horror buff, reaching back about as far as Romero's Night of the Living Dead, loving the classic era of modern horror (1970's) and most of the first installments of the era of sequeled/franchise horror (Nightmare, Friday, Halloween, etc.). Perhaps my favorite genre is the splatter film, gore film, or "Splatstick." Most notable on my list of favorites here is Romero's Dawn of the Dead, which is vastly superior to Zach Snyder's 2004 remake, and also Romero's lesser seen Day of the Dead. The "cabin in the woods" genre is almost a subset of horror in and of itself...it kind of goes hand in hand with the summer camp sleepaway horror flicks, except that with the lone cabin, ala Sam Raimi's The Evil Dead, you are on an island, so to speak, as far as being utterly alone. So we have your standard cabin in the woods flick here...insomuch that the damn title is even, "Cabin in the Woods!" Well, that's actually just a bit of tongue-in-cheek marketing at play, because this flick is anything but standard. Cabin in the Woods is much more of a comedy than it is a horror flick and while there were a few hearty jump scares that got my blood pumping, this is a flick that is wholly self aware and is played much more for laughs, than for pure horror scares. 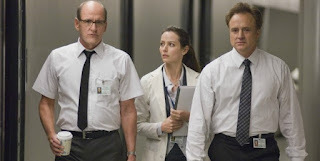 At the outset of the flick, you meet a pair of scientists in Bradley Whitford and Richard Jenkins. They are talking about some kind of operation that is going on around the world, and how it has come down to the Japanese and the Americans to come through. Out of the gate, you realize, this is a horror flick with a twist, and at no point during the movie, does the film try to keep you from realizing that things are absolutely not what they seem. That is the beauty of this movie, it is telegraphing its differences from your standards run of the mill horror flick, but you still have NO IDEA what the end game is, and that keeps you 100% invested in seeing this story unfold! The story...a genius effort from Drew Goddard and Joss Whedon, with Goddard also directing. Goddard has been on Team Whedon since the good ol' Buffy and Angel days, being involved as a writer on the prior and a writer and story editor on the latter. 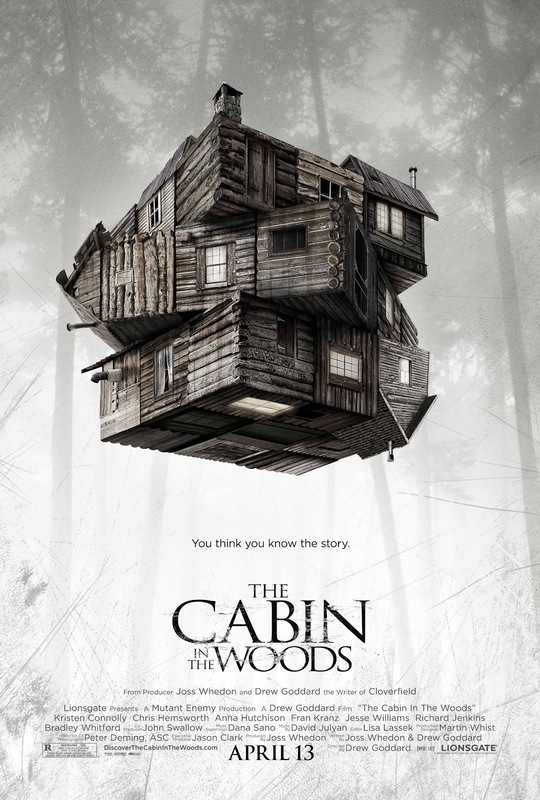 Cabin in the Woods is exactly what it sounds like...a story about a cabin in the woods. My only surprise was that we started off with only five kids headed out to the wilderness, which seemed like a little light on victims, but in the end, it all came together and it all made sense. The five kids include quite a spread of folks, most notably including Chris Hemsworth as Curt. Yes, Thor himself is one of the primaries in this thing, and this was filmed long before he hit the mainstream as Kirk's papa in the 2009 Star Trek reboot and certainly before he became the God of Thunder and started his path towards the Avengers. The other four are much lesser known actors, but things may changes as this flick is bound to launch them into somewhat of a cult status as the hapless victims in a new evolution in horror. Let me not spoil a thing about this story, other than to say that you have never seen anything like this and while you learn early on that a team of scientists is following the plight of our young victims, you really have to wait until the very end to learn why. Also, there comes a moment at the end of this flick when this thing just blows off the rails into super crazy, and when it does, you will either love it, or like the older couple in my theater, perhaps stand up and exit the theater. I think most of you will love it, but it gets crazy, fast, as this flick heads toward its resolution. 4.5 of 5 Horns for this fantastic reinvention of a played out subgenre of the horror scene. Kudos Mr. Goddard, Kudos Mr. Whedon....now Joss, you best not let us down with The Avengers...I have faith in you...you gave us Firefly, they took it away, but you continue to thrive, and I will consume every bit of what you serve! 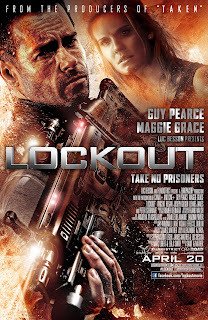 Just as Cabin knows what it is, so does Lockout: a silly, action-packed sci-fi comedy. I almost wanted to add thriller in there, but I think there is a marked lack of drama, and while there are some thrills in the action, it isn't really a thriller. In fact, given the startling rate at which Guy Pierce's Snow spews one-liners, this is almost a full fledged comedy. Produced by Luc Besson, a genius who among other things, brought us The Fifth Element, which also had a fair amount of comedy, but didn't seem to try nearly as hard. If most of his jokes didn't stick, I would have walked away from this with a completely different view, but for trying so, so hard, this script was actually pretty damn funny! If it isn't the funny, it may be the pain old fashion fun. This movie would perhaps be the B-movie stuff of late night SyFy if not for Guy Pierce's absolute affability. 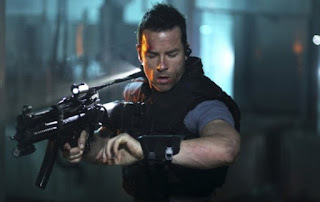 He is just plain lovable as our anti-hero, mixing one part John McClain (badass reluctant hero), one part Snake Pliskin (concepts), and one part Michael Weston (Burn Notice -- looks...Damn if Pierce isn't the spitting image of Jeffrey Donovan in this!). This is nothing to write home about. It is a fun movie and it takes you on a fun ride. In the not so distant future, there is a low-orbit space station, known as MS-One or Maximum Security-One. A prison, with hundreds of beds, being used a test facility where prisoners are kept in stasis during the course of their prison terms, eliminating the troubles with your average run of the mill prisons. The president's daughter, Emily Warnock, played by Maggie Grace, is off on a humanitarian mission to interview some of the prisoners, to see if the rumors about stasis dementia are true and if the concept of MS-One is actually a sound one or just good for show. Of course, her visit goes badly, the prisoners overpower her protectors, and ladies and gentlemen, we have ourselves a good old fashion hostage situation. Now we have something in the vein of Escape from Los Angeles, the vastly inferior, 1996 Carpenter sequel to Escape from New York, in which Snake Pliskin is sent to LA to retrieve the president's daughter, who has run off to cause some mischief. The concept is similar, except that Emily Warnock hasn't chosen to be in peril, but the story did in fact demand it. Snow is a disgraced CIA operative, who has been accused of treason, and who stands to be sent to MS-One for a sentence for his own crimes, before he learns of the rescue request that is being made of him. He basically tells them to piss up a rope, until he finds out that his confidential informant, who happens to have a piece of information that proves his innocence, is already an inmate there. Of course he accepts the mission and nearly 30 minutes in, things really start to get moving. I make a note of this because the flick is not excessively long, and for taking a few extra minutes getting snow to the space station, it really keeps the pacing of the rescue itself moving along nicely. Lennie James has a great supporting role, as does the ever smarmy Peter Stormare. The main badees are played by Vincent Regan and Joseph Gilgan as Alex and the psychopath Hydell. Hydell is excessively over-the-top in a deliciously evil kind of way. Look...this is not the best action flick you will ever see, but it is interesting, enjoyable, and out and out fun, for my movie dollar. I give it 3.5 of 5 Horns and say critics be damned, it was a fun time in the theater. Until later gang, take care! !